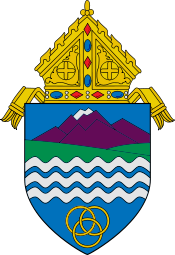 Created in November of 1983, the Diocese of Colorado Springs serves a territory that spans 10 central and eastern counties of Colorado. The diocese serves more than 170,449 Catholics in 39 parishes and missions. The diocese and its parishes provide religious education and formation to more than 9,259 students. To keep up with the needs of the diocese's growing population, its social outreach continues to expand. Last year, Catholic Charities of Colorado Springs assisted over 240,000 individuals and families.